After the 4-2 loss to the Phillies, Cardinals' manager Tony La Russa said he felt worse for Mark Mulder than he did for the team. Mulder as much as took himself out of the game after calling medical personnel from the dugout after facing only three batters. Mulder stated that he felt significant pain on a strikeout pitch to the Phil's leadoff man, Jimmy Rollins. From that point, Mulder revealed that the pain lessened, but that he couldn't get his arm up to where it needed to be to make an effective delivery. His description was evidenced by the eight straight balls he threw to the next two hitters. After only 16 pitches, Mulder's night was over, and considering his past injuries, the possibility of a longer down-time becomes a major concern. Brad Thompson would come on in the first inning with only one out and two Phillies' base runners aboard. The middle infielders would help him out of the jam, Aaron Miles pivoting on a Ryan Howard ground ball, to Izturis, to Pujols for an inning-ending double play. The game turned into a duel between Thompson and Phils' starter, J. A. Happ. The Phillies attempt to something going in the third was snuffed when Cards' catcher Jason LaRue gunned down Victorino attempting to steal second. LaRue's throw was perfectly spotted, a couple inches off the dirt on the first base side of second base. The Cardinals wasted a LaRue double in the fourth. Thompson pitched himself in and out of jam in the bottom of the fourth, the Phillies stranding a couple base runners. Happ then took his turn at putting himself in a bind in the next inning, allowed two Cards' base runners before pitching his way clear by striking out Ryan Ludwick, then, after intentionally walking Albert Pujols, getting Troy Glaus to fly out. The Phils got to Thompson in the fifth, Carlos Ruiz singling, then scoring on a Rollins triple. A couple batters and a single later, Howard singled home Victorino to put the Phils up 2-0. La Russa called upon Russ Springer, who struck out Pat Burrell to stop the bleeding. Happ sailed through his half of the sixth, but the Cardinals went to their fourth pitcher of the night with Jason Isringhausen. The former Cards' closer walked one batter, but picked on Happ for the last out. Cesar Izturis and Skip Schumaker would finally chase Happ in the seventh, hitting a single and a double, respectively. Chad Durbin relieved Happ, but ended up walking Ludwick. Pujols hit a sacrifice fly, scoring Izturis to bring the Cards within one at 2-1. Glaus then singled to center, Schumaker scoring the tying run. Ankiel was then walked intentionally to load the bases. Joe Mather pinch-hit for Isringhausen, but struck out to end the Cardinals' chances for a much bigger inning. With the game tied at 2-2, La Russa called in the fifth pitcher in the form of Kyle McClellan, who cruised through the seventh. Phillies' manager Charlie Manuel brought on Clay Condrey to start the eighth inning, striking out LaRue, Brendan Ryan, and Izturis, the lot of them swinging. McClellan had the Phils' eighth inning leadoff man, Howard, down 0-2 before throwing a mistake pitch, Howard depositing the ball in the right field stands, the Phils reclaiming the lead at 3-2. La Russa went to his fifth reliever, sixth pitcher overall, calling in Chris Perez. For two batters, it appeared as if Perez would give the Cards a shot at a one-run chase to tie when he struck out Pat Burrell and Jayson Werth. Pedro Feliz would have none of Perez's ideas of striking out the side, however, taking the rookie deep to left, increasing the Phillies' lead to 4-2. 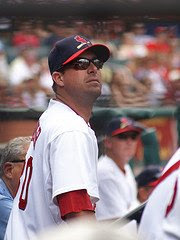 The Cardinals would face Brad Lidge in the ninth, the closer opening the door by walking the leadoff man, Schumaker, bringing the tying run to the plate in the form of Ludwick. Lidge would get the two Cards' All-Stars, however, striking out Ludwick on a perfect low and away pitch, then getting Pujols to lift a low pitch for an easy fly out to right field. Still, Lidge couldn't stand prosperity, walking Glaus after having him down in the count. Ankiel had a chance to play hero once more, but it was not to be, Lidge getting him down 0-2 and then getting him to swing over a low pitch and strike out to end the game, the Cards going down 4-2. The loss will force a rubber game tomorrow afternoon, with the bullpen usage already on the verge of out of hand. La Russa will field a time, all right, and won't have a problem until the rotation brings the Cards around to Mulder's spot once more. At this point, there is no telling what the Mulder situation will be, but you might imagine how much Mozeliak's wheels are turning now, with the trade deadline getting closer every day.